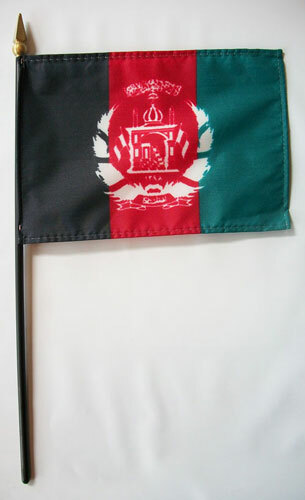 Our 4" x 6" Afghanistan stick flags are made from a high quality, silk-like polyester fabric. They feature a hemmed flag mounted on a black plastic 10 inch staff with a gilded spear point. These versatile stick flags can be used on tabletops and desks, to wave in parades, or to decorate flower arrangements.